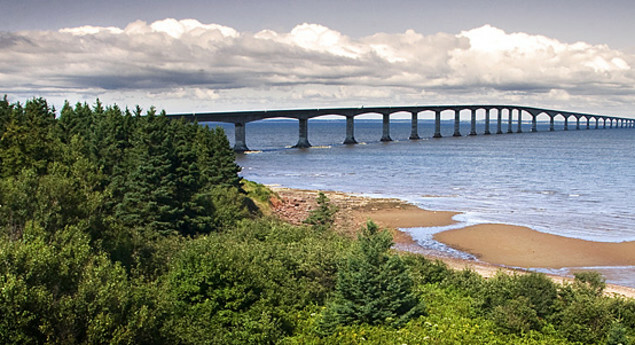 The majority of construction of the Confederation Bridge was carried out at on-shore staging facilities in Prince Edward Island and New Brunswick. Construction began on October 7, 1993 and the bridge officially opened on May 31, 1997. The staging facility in PEI was where the main bridge components – including pier bases, shafts, main girders and drop-in girders, were produced. At peak production, 2,079 craft workers and 415 staff were employed in building the bridge. In total, more than 5,000 people were employed during the construction phase of the project. The total cost of construction was one billion dollars and it is the longest bridge in the world crossing ice-covered water. Photo Credit: Photography copyright (c) The Confederation Bridge. Licensed under the Creative Commons Attribution-ShareAlike License. It's cool to know that my family helped create this magnificent structure. 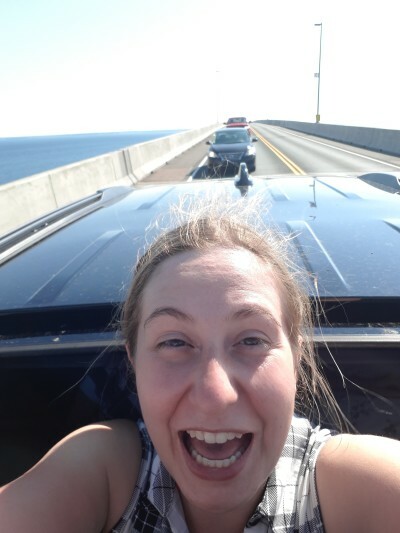 My favorite memory is taking a video of the bridge through the sunroof. It really makes for a great experience driving over a bridge. 12.9km long, that's the length of the bridge. It takes about 10 minutes to cross at 80km per hour, if I remember well. The ride was easy and smooth. No edited needed, these colors are as real as they get. Standing on the island shore Thanksgiving weekend, I admire the incredible craftsmanship of the Confederation Bridge. Prince Edward Island is where I go to visit most of my family from Charlottetown to the small Acadian region of Evangeline, my heritage is on that island. Though I live on the mainland, the bridge gives me the opportunity to stay connected to my roots. For that I believe the Confederation Bridge is an important part of Canada since it helps connect our nation. I prefer ferry since I don't often go on one. I love flying into PEI, especially in the summer, because all of the different colours of the fields looks like a patchwork quilt from the sky! During the construction of the bridge, the environment was highly considered. It was not limited to the sensitive Northumberland Strait lobster industry. Constructed were also nesting platforms for which endangered species? Photo: Photography copyright (c) The Confederation Bridge. Licensed under the Creative Commons Attribution-ShareAlike License.